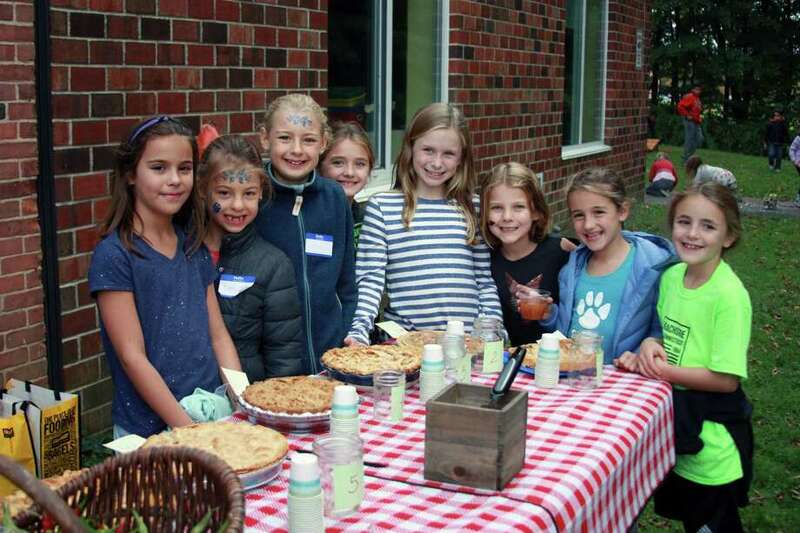 Students participate in South School’s inaugural Garden Harvest Day on Oct. 14 in New Canaan. The New Canaan Beautification League will present “City Green: Public Gardens of New York” with author Jane Garmey on Nov. 7 at 9:30 a.m. at the New Canaan Nature Center. In “City Green,” Garmey explores not only the well-known but the undervisited gardens of New York City, and details the vitality, variety, and beauty of the city’s landscapes and the growing appreciation of how gardens enhance the quality of urban life. Garmey is a noted garden writer and contributor to the New York Times; this will be her third visit to the New Canaan Beautification League. This program is free and open to the public. For more information, visit newcanaanbeautification.org. The Daniel Edward Offutt III Private Foundation Trust recently awarded a grant for $215,000 to Silvermine Arts Center. Silvermine was one of a number of nonprofit cultural and arts organizations in Connecticut to receive funding. Offutt was a Weston resident and stock-market investor. Born in Oakland, Md., Offutt was educated at the University of Maryland and received an MBA from Columbia University. Silvermine is one of several Fairfield County nonprofits that will benefit from grants from the Offutt Foundation Trust. Recipients include the Library Associations of Wilton, Weston, and Westport; Beechwood Arts; the Regina A. Quick Center for the Arts at Fairfield University; the Cultural Alliance of Fairfield County; the Westport Historical Society; and others. The New Canaan Historical Society will host Memories & Margaritas: A Dinner Discussion with Gwen North Reiss and the Guerrero family on Nov. 4 at 5 p.m. Hear the family reminisce about their years living in New Canaan with their famous father, Pedro E. Guerrero, photographer for architect Frank Lloyd Wright, the artist Alexander Calder and others. Reiss is a writer and poet who has coordinated many of the oral history interviews for The Glass House. She interviewed Guerrero twice. She is also publicist for the Silvermine Art Center. The cost is $30 for members, $35 for nonmembers. Call the Historical Society at 203-966-1776, or email ddearth@nchistory.org. The dinner is in conjunction with the exhibit “Pedro E. Guerrero: The Photographer of Mid-Century New Canaan,” which continues through Dec. 9. The exhibition includes 53 of Guerrero’s black-and-white photos, and a second gallery devoted to the life of Guerrero. The exhibit will be open for viewing before and after the dinner from 4 to 8 p.m.
It’s been a little over a year since South School broke ground on its first-ever South School Garden. The fully enclosed learning garden features multiple raised beds, two wheelchair-accessible beds, a drip irrigation system, a compost bin, student benches and a teacher work table. On Oct. 14, South School held it’s first annual Garden Harvest Day. Over 150 people attended the event. There were six stations set up for students and their families to get involved in: Bed Cleanup (what to harvest, pull, compost, prune and plant), Plant Bulbs, Pollinator Beds (plant two pollinator beds with native pollinator plants), Scarecrow Stuffing, Challenge Your Senses (taste test various vegetables, smell test of herbs guessing game and bean shelling) and Harvest Table (where students filled display baskets with the harvest from the garden). Students were able to plant garlic and bulbs, stuff their very own South Scarecrow and harvest the garden. The day also featured a schoolwide apple pie contest. All produce from this harvest was donated to Person-to-Person in Darien. Food Allergy Research & Education will hold the second annual FARE Connecticut Fall Luncheon on Nov. 7 at the Greenwich Country Club. All proceeds will benefit FARE, a national nonprofit organization with the mission of improving the quality of life and the health of individuals with food allergies. Jocelyn Walls, a New Canaan mother of two boys, one with multiple food allergies, will be recognized for her accomplishments and civic leadership. In 2016, Walls began as chair of Food Allergy Connecticut and currently serves as co-chair of the group. Food Allergy Connecticut offers support coffees, family workshops and an annual speaker series to provide education and connect Fairfield County families managing complicated food allergies. The Luncheon begins at 11 a.m. with a marketplace of local food allergy friendly vendors. Tables are available for $10,000, $5,000 and $2,500, and individual tickets are available for $1,000, $500 and $250. Scott Crane was promoted to co-managing partner at Reynolds + Rowella, effective Oct. 1. The firm, with offices in Ridgefield and New Canaan, provides tax, audit, accounting and consulting services to closely-held businesses and high-net-worth individuals. “We are very pleased to have Scott Crane as our co-managing partner,” said Frank Rowella, founder and co-managing partner. “Scott has been a partner with the firm for 12 years and we are confident that his new role will help to guide the firm well into the future. Crane, based in the firm’s Ridgefield office, joined Reynolds + Rowella in 2003 as a tax manager and became a partner in 2006. Over the past 30 years, Crane has worked exclusively with privately held businesses, specializing in finance, construction, real estate, retail and manufacturing.